With an average production of 50 movies per week and about US$590 million revenue annually, Nigeria's film market is booming. Dubbed Nollywood, it has overcome the teething problems of the late 1980s and 1990s to become a leading producer of films. It ranks second to India's Bollywood. That the Nigerian film industry is growing is not in doubt. What requires greater attention is the problem of piracy, which has become a menace that has eaten deep into the industry and may grind it to a halt. Although Nigeria has laws against piracy, it remains a thriving business partly due to poor implementation of copyright laws, a near-lack of prosecution of offenders, and corruption in governance agencies. In July 2014, less than three weeks after the release of Half of a Yellow Sun, a film adaptation of the award winning novel by Chimamanda Ngozi Adichie, Lagos film vendors were found hawking pirated copies of the film around the metropolis. In 2015, popular Nigerian actor and award winning producer, Kunle Afolayan, was notified that his classic film October 1 had been pirated and was already being sold on Lagos streets at N500 ($3) per copy. The film had yet to recoup the $2 million invested in its production. Afolayan then threatened to leave Nigeria if legitimate businesses would not be allowed to thrive due to the activities of pirates. These cases highlight the menacing effects of pirates within the Nigerian film industry, which loses an estimated US$2 billion to piracy every year. The Alaba International Market, founded in the 1970s, is located along the Lagos-Badagry expressway. It is by far the biggest electronics market in West Africa and thousands of people flock to it every day. They come from as far as Ghana, East Africa, Togo and Benin Republic. The market has a mixture of individual customers and retailers who buy in bulk to resell across West Africa. They buy a wide range of items - including computers, televisions, broadcast equipment, household appliances, video games, generators, security equipment, CDs and DVDs. It is here, in the belly of the beast, that I conducted a study of the informal networks of movie pirates. There are two categories of pirates, often working together. First are registered retailers who displayed original (white face) copies of films for sale, but conceal the green face (pirated) copies in their shops. 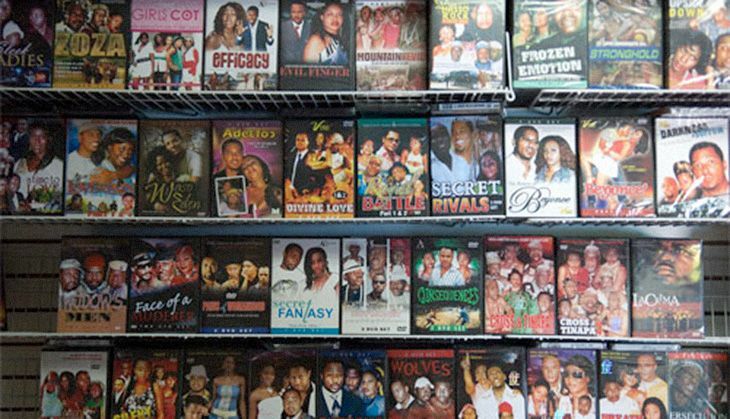 They claimed to be retailers of original Nigerian films, but use the original copies purchased legally to mass-produce "pirated" copies for sale to increase profit. The second category comprised of "associates". Officially they are appointed by the copyright owners to distribute their films. But owing to their strategic position in the distribution chain, they reportedly make secret business deals with dubbing companies. These companies dub copies without obtaining legal permission from the copyright owners. The involvement of these various stakeholders in the film industry makes fighting piracy a herculean task. In the market where I conducted my research, the presence of anti-piracy groups was no deterrent for the pirates. They still carried out their business by working with associates. These so-called associates work with the copyright owners or with the dubbing companies contracted by the copyright owner to produce official DVDs. They are often salesgirls of marketers or executive producers. This means that associates have access to original copies of new films before they are released. They sell these to the pirate-retailers, often masquerading as legitimate retailers. The pirates can therefore ensure early pirate production of original copies. They thereby hijack the market from copyright owners and make more money at their expense. Pirated copies can flood the market on the same day the copyrighted films are released into the market or the day after. Although it is more expensive to buy from their associates, pirates are often willing to pay the extra in order to guarantee more profit. Like in any criminal operation there are those at the top who pull the strings and who make the real money. In Nollywood, the marketing bosses are often in on the scam. These dodgy bosses are sometimes major financiers of films in the Nigerian film industry. The big money that they possess and the "underground structure" they maintain make them indispensable to copyright owners and in the marketing of films. They wield a lot of power and use this power to gain total control of the market. By working with pirates to illegally distribute the very films which they finance, they are able to secure income from both legal and illegal streams. The piracy business is sustained by informal networks. This extends to penetration of the security outfits saddled with the task of arresting pirates. A pirate told me that he has an informant who gives him information about planned actions by the law-enforcement agents. This includes warning them when there are plans to raid their shops. Another pirate disclosed that they "bribe their way through" whenever they were arrested. Pirates remain confident of securing their release from anti-piracy agents whenever arrested. This shows that corruption within anti-piracy agencies directly sustains movie piracy. This clement environment supports extortion and incentivises the pursuit of individual gain at the expense of the industry. If there were a real threat of arrest and prosecution, these clandestine networks would be more likely to break down. This would allow intellectual property owners to have access to their legitimate gains. Until then, Nollywood may continue to grow - but at a cost.